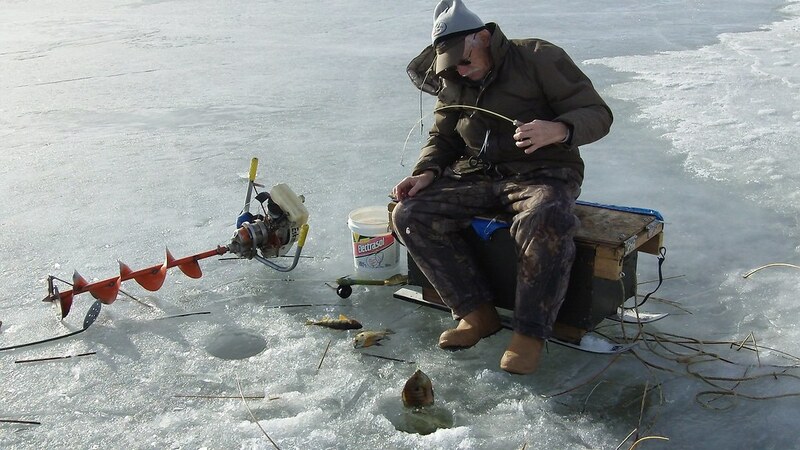 Ice fishing equipment and gear have come a long way in the past twenty years. Today there are several excellent companies dedicated to developing products to help you catch more fish and make your time on the ice more enjoyable. This ice fishing equipment and gear section is broken up into several categories. We'll start with the basic equipment you'll need like rods, reels and tackle. We'll also talk about heaters, sleds, clothing. And, of course, we'll get into modern electronics including flashers and underwater cameras. With all the equipment and gear available for ice fishing it will definitely come in handy to have a packing list so you don't forget something important! Can I fish in sanctuaries or areas posted as closed? French River (St. Louis County): From Lake Superior upstream to Minnesota Highway 61. Knife River (St. Louis and Lake counties): From the top of second falls to 100 feet downstream and from the bridge on Minneosta Highway 61 downstream to signs posted below the fish trap. Lester River (St. Louis County): Immediately downstream from he Superior Street bridge to the bottom of the first falls. Devil Track River (Cook County): Fishing allowed in this sanctuary from June 1 to August 31 from mile 1.1 to mile 1.6. Kadunce River (Cook County): Fishing allowed in this sanctuary from June 1 to August 31 between between mile 0.2 at the lower falls to mile 0.4. Gauthier Creek (Cook County): Entire stream open to fishing from June 1 to August 31. "The ice fishing season was winding down, but the five-building Ice Castle Fish Houses manufacturing facility was whirring in late February with the sound of circular saws, nail guns, forklifts and vacuum cleaners. Most of the Ice Castles that come off Minnesota lakes in March will head back down the highway before the next hard-water season. Some will appear this summer in campgrounds, some this fall at hunting camps. Some won’t ever make it onto the ice. What started with a request for air-conditioned fish houses has transformed the business. Half of the Ice Castles produced today are RV models with a full shower. “Once we did that, that really revolutionized our business and I think it brought us a new customer base, too. I see the benefit. They can get more bang for their buck,” said Brett Drexler, general manager and son of Ice Castle Fish Houses founder Jeff Drexler." "The popularity of fishing contests (tournaments) in recent years is reflected by the nearly 450-600 permits issued annually by DNR to contest organizers. The DNR regulates fishing contests to protect fish and fish habitat, to restrict activity during high use periods, and for the safety of the participants. Regulating contests through the DNR tournament permit program also serves to reduce the potential for conflicts with other water recreationists at public access sites and on the water. Since 2001, the DNR has limited the number of contest permits issued monthly on any water body, which serves to distribute contests across many lakes and rivers." "Bigger is better in Minnesota. Larger lakes have greater resources, or rather, deeper pockets. Voluminous lakes, by and large, produce bigger fish and recruit at a rate advanced of lesser bodies. No doubt, occasionally, smaller venues put it all together, but it never lasts long. We’ve all been there when, unexpectedly, that 200-acre boilerplate pumps out plump crappies faster than Happy Meals through a McDonald’s drive-through. It’s good when it’s good. Limits are common. Word filters through town. Freezers are filled. When the outbreak ends, the little ol’ 200-acre millpond is left naked in the cold with only culled runts left to nurse. Only time and a divine intervention will put the lake’s smile back on. Big lakes are better equipped to handle such pressure. Typically, besides the obvious advantage of size, there’s more forage, structure and diversity of habitats to shroud particular populations from filet-craving weekenders and locals as well. Opportunely, several of Minnesota’s larger lakes are steeped in positive cycles, yielding not only numerical volume, but also massiveness. And if you’re of the ilk that judges success in pounds of pressure on the rod similarly or greater to pounds in the cooler, I think you’ll appreciate these offerings."